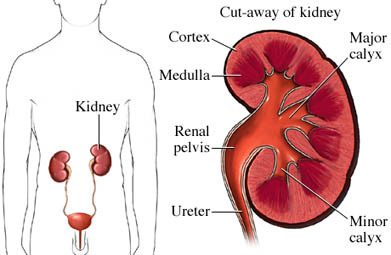 Renal (kidney) failure, is the inability of the kidneys to perform their normal functions. The kidneys are 2 bean-shaped organs on either side of the spine in the lower back. Their main functions are to remove waste from the body and to balance the water and mineral content of the blood by filtering waste, minerals, and water. The waste and water combine to form urine. End-stage renal disease can lead to anemia, high blood pressure, bone disorders, heart failure, and mental confusion. What are the risk factors for end-stage renal disease?What are the symptoms of end-stage renal disease?How is end-stage renal disease diagnosed?What are the treatments for end-stage renal disease?Are there screening tests for end-stage renal disease?How can I reduce my risk of end-stage renal disease?What questions should I ask my doctor?What is it like to live with end-stage renal disease?Where can I get more information about end-stage renal disease? What I need to know about kidney failure and how it's treated. National Institute of Diabetes and Digestive and Kidney Diseases website. Available at: http://www.niddk.nih.gov/health-information/health-topics/kidney-disease/kidney-failure-choosing-a-treatment-thats-right-for-you/Pages/ez.aspx. Updated September 2014. Accessed November 17, 2016. What is kidney failure? National Kidney Foundation website. Available at: https://www.kidney.org/atoz/content/kidneyFailure. Accessed November 17, 2016.